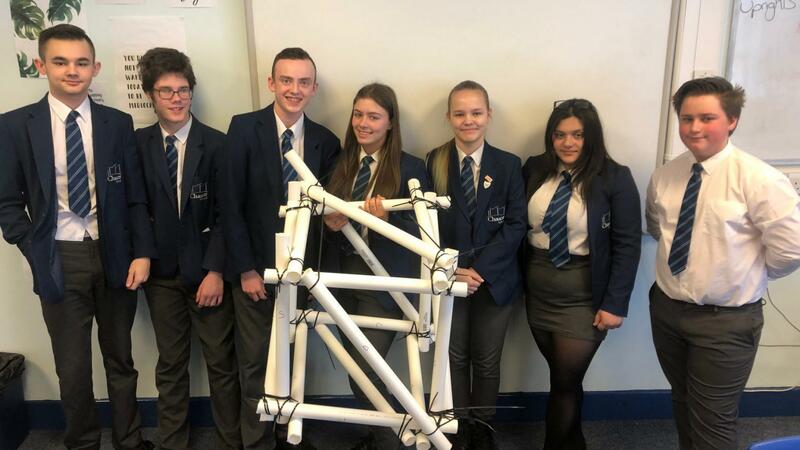 Year 10 Ambassadors on the Better Learners Better Workers (BLBW) scheme took part recently in a scaffolding challenge run by Haydn Tomlinson from Keepmoat Homes! Workshops like this showcase the programme’s ability to impact on student behaviours, outcomes and achievements. Students develop personal confidence and motivation, career aspirations, awareness of the world of work and employability skills. The students, from Chaucer School and Sheffield Park Academy, are all enrolled on the Construction and Built Environment Strand of the BLBW scheme. This was the first school workshop to start the programme of activities. Under timed conditions, the students had to work as a team to build a structurally stable cube out of lengths of waste pipe and cable ties. They were tasked with first designing the cube, including researching which shapes would support the heaviest load and be the strongest structurally. With a theoretical budget, the students were required to “buy” the resources they would need to construct the cube. Once they had designated roles such as Project Manager, Resource Manager, Health & Safety Coordinator and Quality Assurance Manager, they worked as a team to organise the lengths of pipe into relevant sections. Following a set of diagrams and instructions they assembled the correct pieces to construct the desired structure. The teams achieved varying levels of success, but all enjoyed the task, learning a lot about a new trade and working with people with similar interests. It was a great opportunity for the students to put their knowledge to the test in a practical situation. For the next session, the students will visit a live construction site to see how all the different roles interlink and how they work in practice.